Still looking for the perfect Valentine’s Day gift? As the date approaches Bella Forte Designs has the perfect gifts on our Ready Made page! Ordering online is quick, easy and you will get it in time for the big day! Share all the ways you love your lover in a petite journal. 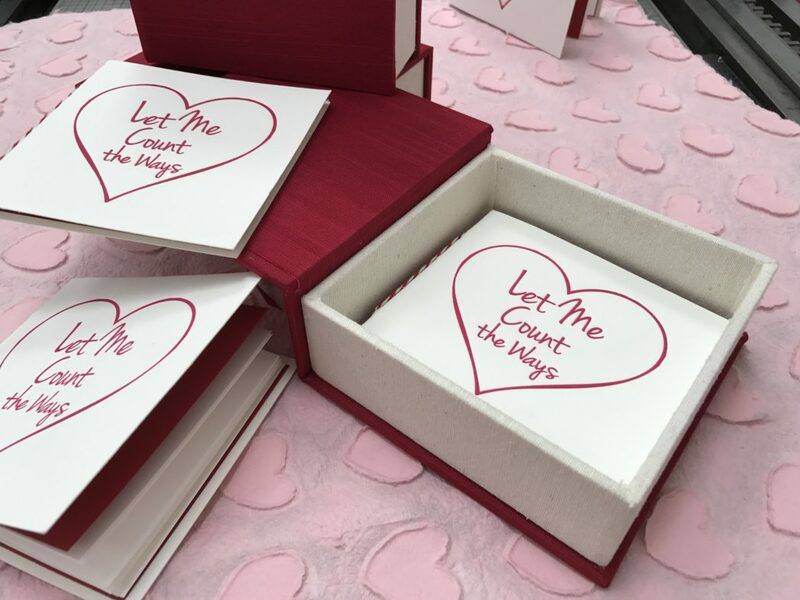 A letterpress design adorns the cover and reads “Let Me Count the Ways” giving you the opportunity to compliment your love. Housed in a silk box this small book will be a big gift. Writing not your strong suit? Consider gifting your special someone a keepsake box then! Our decorative boxes come in seven color options. They measure 11.75”W x 9.5”H x 3.5”D making them the perfect size to keep all the loving memories and photos from your time spent together. Already married to your Valentine? Then give them a wedding keepsake box. This special box will hold all your wedding memorabilia, with an inset for both a photo and the wedding invitation. With a personalized embossing of your names and the special date this gift will go down in Valentines Day history! Need something more custom? Look through our products page to order or get a quote today! Previous PostHello Santa Fe Bella Forte Designs Has Arrived!